We now have proof that fibromyalgia symptoms are real. As you will see throughout the website, the last fifteen years have brought great improvement in the Medical study of fibromyalgia. Many scientific studies have measured physical characteristics in fibro sufferers, even at the cellular level, that differ substantially from the non-fibro population. So at least, in the 21st Century there's no remaining doubt that fibromyalgia symptoms are real. And, in fact as of July 25, 2010, fibromyalgia was officially recognized as a condition that justifies USA Social Security Disability benefits. Oh yes, fibromyalgia symptoms are much too real. At times, the number of fibro symptoms, the intensity of the pain, the debilitating fatigue, the night after night of non-restorative sleep and the relentlessness of this myriad of symptoms can lead us to think: "If my life is going to be like this, I don't want to live it! I know, I've been there, and still there living with symptoms since a young age, and like you, I still have to deal with not only fibromyalgia and other co-conditions, but aging itself. We all want the best quality of life possible. Just over ten years ago, after three decades of living with symptoms, I knew that there was still no "silver bullet" cure. Still, I was unwilling to let it define my life. So, I decided I would “eat the fibro elephant one bite at a time” or really "one symptom at a time!" That’s the path I’ve been on within the last ten years (now four decades into living with symptoms); looking at potential remedies to improve quality of life. Mediating (not curing) these "symptoms" of fibromyalgia including creating a toxin-free environment, effective tools, low impact exercises for fibro people, mind-body techniques and the best nutrition for a stronger "foundation". Please listen to me. You can learn to better manage your symptoms; I did and still do. This is not about some false cure, but if you are serious about recovering a life that has more good days than bad, study this website. It has every step of the protocol I've used to attain the best quality of life for myself, my clients and followers. Don't misunderstand, I still have tough days but I also have more good days than bad overall, even living with all of the primary co-conditions. And, my protocol requires consistency; but, trust me, it's a gift that keeps on giving. I wish I could work face to face with every fibro sufferer and help them find their individual path to improve their fibromyalgia symptoms. I truly believe that we can find the brighter side to this insidious illness through consistent use of the protocols set forth and the continuing support and content provided here in the website. The positive feedback we get comes from those who really do just that. We continue to add content and better strategies to convey everything we do here. No matter what your situation, on disability, working, full time parent or caretaker. You deserve a better quality of life. I have tried to incorporate enough background information that you should be able to select what YOU specifically need. 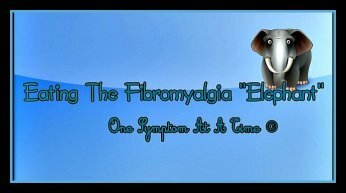 In the various “treatment” articles, pay close attention to the specific fibro symptoms that are described. Ask yourself, “Is that me?” If so, try the suggested protocol for a reasonable period. And, remember it’s never “all or nothing”. There are more important elements to my fibromyalgia symptoms protocol that require only your time, commitment, and consistency. How cool is that ! BTW, always keep your health care professionals in the loop regarding any supplements you’re taking. You can see an extended fibromyalgia symptoms list in which each symptom is a link to a treatment option by clicking here. If you have not been diagnosed by a medical professional, I suggest that be your next step. You might want to feel out your doctor's familiarity with fibromyalgia. If it's not in his/her realm of experience, do some research to find a doctor that has treated fibro. You may want to read my Fibromyalgia-Diagnosis page to learn what a good doctor who understands fibromyalgia should do to make a diagnosis. You can help by being familiar with the process and having answers to the most likely questions. It's important that you find a doctor familiar with fibromyalgia symptoms and the range of treatments available. Fibromyalgia is no doubt a very complex syndrome. The symptoms are varied and wide-ranging. And, not all symptoms show up in every fibro victim. As well, not all symptoms affect each sufferer to the same degree. 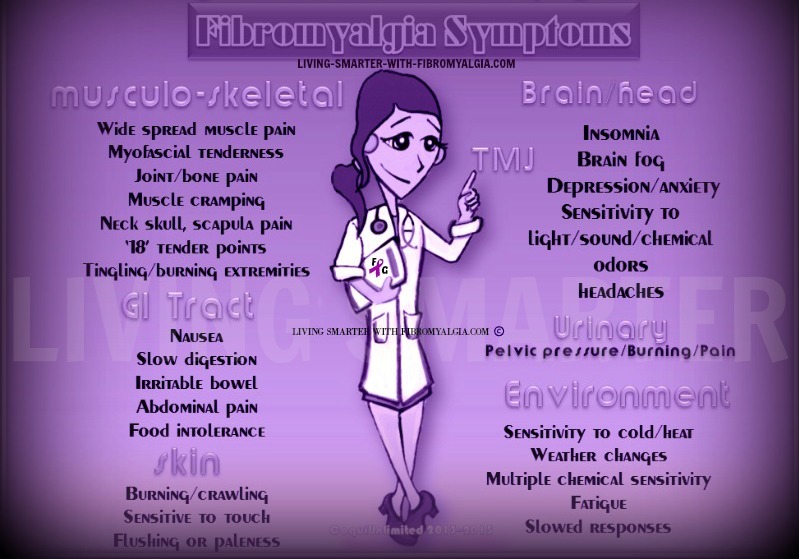 Even though I have, by any measure, severe fibro, I can look at the above illustration of common fibro symptoms, knowing that I have successfully alleviated some while reducing others to create a more functional life. The chronic pain of fibromyalgia plays havoc with our built-in pain response. Our pain response system protects us well from repeatedly touching a hot stove, but sends our system into overdrive when faced with recurring chronic pain. And, the pain can be relentless; so much so, that we try to find a “groove” that doesn’t make it any worse. Unfortunately, that “groove”, that fear of exacerbating the fibro pain becomes our prison that locks us out from the activities needed to achieve mastery over the pain and the Re-conditioning the fibro body so desperately needs. The scientific studies I mentioned include giant steps forward in our understanding of the amazing integration of the mind and body. My Fibromyalgia Resources page lists a number of sources that specifically address the mind body connection. The techniques in these sources are of critical importance to you as a set of tools to apply to your fibromyalgia symptoms that will help you to mediate them. I've incorporated these powerful mind body techniques such as meditation and deep breathing to allow you to intentionally intervene in the mind body process to release endorphins and other neurochemicals which aid in relieving fibro pain, fibro fog and other fibromyalgia symptoms. I expand on these techniques in my Mind Body Connection page; for now, I just want you to have better understanding of the efficacy of this approach. If you do, you'll be on the road to a better quality of life. The one non-drug treatment for fibromyalgia that is well verified to reduce many of the symptoms of fibromyalgia, especially pain and fatigue, is exercise. Likewise, the one treatment most resisted by the fibro community is exercise. You can read more at Benefits of Exercise. You can also read a comparative analysis of the efficacy of exercise vs fibromyalgia medication here. Hey, I “get” it. I have severe complex fibromyalgia. I know why you resist. And, when I decided to push down some of those walls to study and specialize in working with fibro people I was very fearful. I was in that “Groove” that I mentioned earlier. It was a decent amount of pressure I was putting on myself to get it "right". I had to learn how to work with my fibromyalgia/CFS/MCS, not against it. One of the most challenging things I have done in my life aside from my years working in the holistic health field, was taking the time and effort to become a certified fitness trainer specializing in fibromyalgia. I learned a big, big lesson for my efforts: the pain of Activities of Daily Living (ADLs) did not predict the pain of exercise. I share the difference between structured safe exercise and daily activities. Follow me on the Fitness page, Fibro Fit People. ADLs involve totally unstructured movement, whereas, my fitness routines are very structured. Moreover, when working with clients I demand that they remain focused on their routine to avoid any ADL-like movements that might exacerbate their fibro and lead to a major flare. And, finally, the pace can be as slow as is right for you. In fact, even if it is almost, but not quite, as slow as your de-conditioning, you will eventually re-condition. But, you’ll be on a path that’s not hopeless! When you feel the first signs that you’re growing stronger and your fibro pain and symptoms are improved on ANY level, I guarantee your body will respond with a flood of endorphins – the body’s own pain-killer. That’s a day you’ll not soon forget! Tailored, low-impact conditioning is essential to master our fibromyalgia symptoms. But, be warned that not all personal trainers are knowledgeable in what’s required of fibro conditioning. I learned this the hard way; that’s why I studied and became a nationally certified personal trainer for both myself and the fibro population. I continue to study and develop new exercises, routines and therapeutic exercises targeted at improving the lives of those living with complex fibromyalgia. How Committed Are You To Managing Your Fibromyalgia Symptoms? We have a choice to think or say, "Well, that sounds good in theory" OR we have a choice to start applying these concepts to our own lives. That is truly the most challenging yet most rewarding part: belief…application…results. You can see an extended fibro symptoms list in which each symptom is a link to treatment options by clicking here. Also come visit our Facebook Fitness Page. Living With Fibromyalgia Requires Adhering To Our "Body Clock"
Concerned about your Fibromyalgia Prognosis?